To read the full version, click through to arXiv.org, or from MNRAS here. The paper can be found by clicking through to arXiv.org. The paper can be found by clicking here, or on Arxiv.org. The paper can also be found on the ArXiv preprint server. I am a lecturer at the University of Hertfordshire working primarily on galaxy formation and evolution. I study galaxies at redshifts spanning most of cosmic history, and across practically the whole electromagnetic spectrum (but particularly at far-infrared, sub-millimetre and radio wavelengths), to answer questions about what drives their evolution. I am also interested in using state-of-the-art simulations to test observational techniques, and in large spectroscopic surveys of radio sources (in particular leading the WEAVE-LOFAR survey, which is due to begin in 2018). I am currently making my first foray into time-domain astrophysics; watch this space! For Masters and PhD projects I am currently offering, visit the Centre for Astrophysics Research webpages. 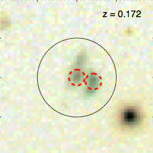 The plot on the right, taken from Smith & Hayward (2015), shows star formation histories (SFHs) estimated using a modified version of the MAGPHYS code, for a simulated disk galaxy whose true SFH (dashed blue line) is known. 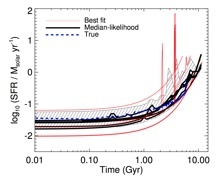 The best-fit SFHs derived from seven different lines of sight (in red) are unreliable and contain spurious bursts of star formation, whereas the median-likelihood SFHs (in black, with uncertainties shown by the grey shaded region) are more reliable.